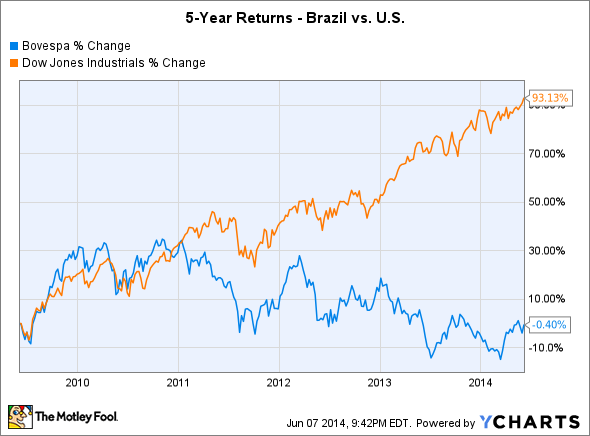 As the World Cup Starts, Will Brazil Lift Global Stock Markets? With the World Cup starting this week, many investors are taking a second look at the struggling emerging market nation. The Dow Jones Industrials (DJINDICES:^DJI) have reached all-time record highs. But internationally, emerging markets have struggled for years now, trailing the Dow and suffering from substantial new problems that they're having trouble overcoming. For Brazil, which will play the first game as the host of the 2014 World Cup this week, the stakes have never been bigger -- and the outcome could determine the direction not just of the Brazilian stock market but also the Dow and other world markets as well. Has Brazil been left behind? Brazil stock market data by YCharts. In large part, the stagnation of the Brazilian stock market has come from the almost complete disappearance of economic growth for the resource-rich company. During the commodities boom of the late 2000s, Brazilian natural resources were in high demand around the world, especially from powerhouse emerging economy China. But as the Chinese economy itself as sputtered, Brazil has seen nearly 10% annualized growth in its GDP in early 2010 drop to expectations of just 1% for 2014. By itself, it's unclear what impact the World Cup will have on Brazil's economy. Initially, analysts were enthusiastic about the prospects for the entertainment and tourism industry, with shares of companies ranging from beer companies and hoteliers to airlines all potentially benefiting from increased attention on the South American giant. Yet as the event draws nearer, expectations for the World Cup's effect on the economy in Brazil have gotten less fervent. Many still believe that Brazil should get at least some boost from the World Cup, especially if its favored soccer team actually wins the tournament, but the long-term impact is hard to foresee and could quickly evaporate in light of other issues affecting the country. Of greater importance to Brazil will be the results of its general elections in October. Pessimistic views of the economy have dampened enthusiasm for incumbent President Dilma Rousseff, with ordinary Brazilians tiring of high inflation and the quick deceleration of growth in the emerging-market nation. Scandals over Rousseff's possible role in issues affecting state-controlled oil giant Petroleo Brasileiro (NYSE:PBR) have the potential to embarrass the Brazilian president at a most inconvenient time. One thing favoring Rousseff, though, is that unlike in the U.S., unemployment rates have fallen to almost unprecedented levels, leaving the general populace better off than they would be otherwise. Meanwhile, economic prospects elsewhere will play a key role in any recovery. For mining giant Vale (NYSE:VALE), for instance, a rise in prices of iron ore and other key metals could bring a long-awaited recovery that could help push both its stock and the entire Brazilian stock market higher. Just as China helped Brazil's expansion in last decade, a recovering China could help bring back Brazilian prosperity this time around as well. Increasingly, investors have looked at emerging markets like Brazil's as being more attractive from a valuation basis than the Dow Jones Industrials. Regardless of what happens at the World Cup, Brazil has an opportunity to prove its worth in the global economic arena that it can't afford to squander.